We must not mislead by the fact that today we call Atlantic Ocean the wide expanse of water, west to European coasts. This correspondence of names is often invoked as evidence, by the supporters of an Atlantis placed in the Caribbean, or around the Azores, and plunged to the darkest oceanic pits. Pytheas, thirty years after the death of Plato, was the first to indicate as Okeanos the vast expanse of western sea, and then throughout the middle ages it was called "Sea of Storms" or "of Darkness". In 150 AD, the famous Geography of Ptolemy designated it as the "western ocean". The name Atlantic Ocean was adopted much later, between the 16th and 17th centuries, after the "discovery" of America, that in a first moment was just baptized "Atlantis". It is therefore misleading and false consideration (by many invoked in support of their hypothesis) that the name given in recent times to the Atlantic Ocean should indicate the location of the ancient Atlantis. There is an oral tradition of Berber people that calls "Bahr Atala", i.e. "Sea of Atlantis", the region of the Shott el Jerid, the bottom of the ancient great lake whose overflow, according to my studies and my hypothesis, was the cause of the real destruction of Atlantis. < Following the berber tradition of the name "Bahr Atala", some French and German archaeologists, in the years between 1920 and 1938, carried on excavations in southern Tunisia, in search of some lost tracks of the empire of Atlantis. Well, this tradition has an important support in a very ancient text, the Book of Jubilees, which is part of the Jewish Bible and of the Coptic one, while in the catholic tradition it is considered to be an apocryphal text. The Book of Jubilees lists all of the genealogy of the successors of Adam. In the chapters that deal with the division of the world between the sons of Noah, it is repeatedly named "the great lake" as the limit of expansion toward the west of the lands entrusted to Cam and his descendants, and at least on one occasion the lake is expressly called "Bahr Atala" or "Bahr Atil" (vocalization depending on the type of translation). From immemorial times the western sailors, who had been forced to move to and from their islands, had learned to sail on the high seas. They had explored the Mediterranean, had settled in the Cyclades and Crete, before that time almost uninhabited, and from there they ran their fruitful trade with Egypt. It can be argued that this type of sea-wolves would not go unnoticed! Well, in Egypt they knew very well those seamen, who were neither Syrian, nor Cretans, nor Mycenaeans. Since Cheops, about 2600 BC, the texts allude to the mysterious seamen. Traders, pirates, mercenaries, from time to time, the 'north wind' prompting them from distant seas until the western branches of the Delta: they were called Haunebuts. The texts of the Pyramids, dated 2500 BC, called the Mediterranean Sea 'the circle surrounding the Haunebuts' or even 'the verdant of Haunebut'. One of the �nine Arcs�, i.e. 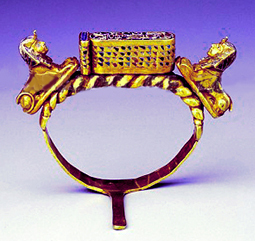 the regions of the Universe dominated by Pharaoh, was called the 'Arc of Haunebuts'. About these nine arches we find memories since the Scorpion King, before the year 3000 BC. Therefore the Haunebuts had to exist before Byblos, Mycenae, before the Greeks and even before the Egypt! Various authors see in this term a mythical and generic expression, attributing the name from time to time to the sea-peoples coming from the North. Haunebuts were not, however, a mythical expression. Temehu and Tjehenu are mentioned from the earliest known Egyptian texts, about 3200 BC. 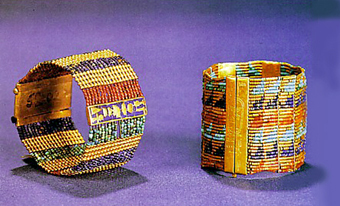 They appear painted in the temple of Sahure, about 2500 BC. Tjehenu are high, good posture, with a rich hair, aquiline nose and a painter to tip. Their skin is white. In this painting they are dressed only with necklaces and other ornaments and a small loincloth. For the official history the origin of the Hyksos remains a mystery, but their departure from Egypt is well documented by the texts. The Theban king Seqemenre undertaken in 1580 an expedition toward the northern territories, against the Hyksos Apophis, continued by his son Kames (Kamose). Between 1557 and 1548 the great Ahmes (Ahmose, Ahmosis), brother of Kames, conquered Avaris and free the Delta, thus founding the New Kingdom. In the tomb of queen Ahhotep, wife, or perhaps mother of Ahmose, called 'Sovereign of the banks of Haunebuts', (Note 4) three damascened daggers were found, together with the ax of the Pharaoh. The decoration of daggers is decidedly of a 'Mycenaean' type and the hieroglyphs etched on blades are rather imprecise. It must be therefore a gift offered to Pharaoh by foreigners, and we know also that his rival Apophis gave to his official 'Aegean' daggers. The Mycenaean civilization, as we know it, did not exist, however, before 1550 BC, and the Treasures found in its fortresses are attributed to achievements by the legendary Danaos against the surrounding peoples. All this reinforces the hypothesis that it is the art of Haunebuts, then masters of Mediterranean routes, allies to Pharaoh Ahmose, a people to which the Queen herself belonged. It is clear that since very ancient times a maritime power dominated the Mediterranean Sea and that the Egyptians ignored its provenance. In 1307 BC, 80 years before the arrival of the Sea Peoples, Claire Lalouette indicates an attack in Libya by newcomers, blond and blue-eyed, that the Egyptians called Tjehenu. The Libu (Libyans), successors of Temehu and Tjehenu, are depicted in Egyptian paintings dressed with long embroidered cloaks, with a single sleeve (the right one), tattooed, with feathers in her hair, part of the skull shaved and a long braid that falls above the right ear. 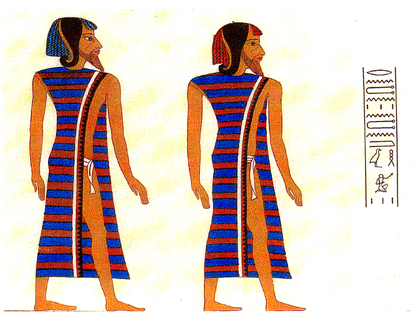 In 1300 BC, in the tomb of Setis I, they are depicted their splendid costumes. A sculpture of the times of Ramses II (1290-1224) represents the typical head of a Libyan, with the braid. In an inscription of the pylon of his funerary Temple, at Medinet Habu, Ramses III is glorified by the divinity: "I put the fear of thee in the heart of the earth of Haunebut. Your Majesty crushed them... the sand sea-rovers shall bow down before thy name". In the 12th century BC, after the raids of the Peoples of the Sea, the Libyan kings went up on the throne of Egypt. The name of the Meshuesh, one of the groups appointed between the peoples of the Sea, resembles closely to the terms of Massyles and Masaesyles, berber peoples who opposed strenuously to Carthage and then to Rome. The Romans called them Mazices, Herodotus pointed to them as Maxyes. Even today, the Berbers call themselves with the term Amazigh. The Meshuesh were probably the most ancient inhabitants of the Maghreb. We stop here, for the moment, in this chapter, which leads us to rediscover the traces of the Atlantis in the Mediterranean of the second millennium BC and to identify the mythical lost kingdom as the cradle of the culture of the bronze age, the architect of the construction of the megaliths and the bearer of the cult of the Great Mother Goddess. Alberto Arecchi, architect, art historian, president of the cultural Association Liutprand (www.liutprand.it), studied for years the hypothesis of Atlantis placed in the center of the Mediterranean Sea. On this theme he published a book (Atlantide, ed. Liutprand, 2001). 1 � W. HELCK, Die Beziehungen �gyptens zu Vorderasien in 3. und 2. Jahrtausend, Harrassowitz, Wiesbaden, 2. Ed., 1971; ID., Die Beziehungen �gyptens und Vorderasiens zu �g�is, Ertr�ge des Forschung, Wissenschaftliche Buchgesellschaft, Darmstadt, dez. 1979. 2 � W. HELCK, Die Beziehungen �gyptens zu Vorderasien in 3. und 2. Jahrtausend, Harrassowitz, Wiesbaden, 2. Ed., 1971, p. 112. 3 � P. MONTET, L�Egypte �ternelle, Marabout, Fayard, 1970, p. 142. 4 � Urk. IV, 21, G. VANDERSLEYEN, Les guerres d�Amosis, in Monographie de la reine Elisabeth, 1971, p. 135. 5 � R. GRAVES, Les mythes grecs, Fayard, 1967, 56b.